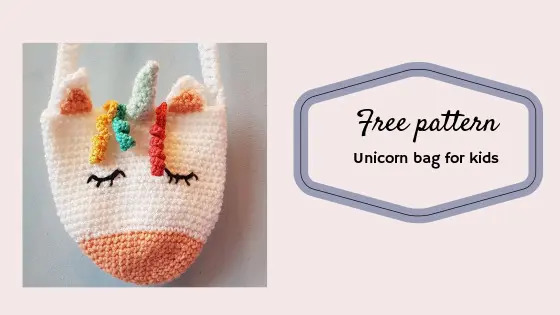 I saw a beautiful unicorn bag for kids on my Pinterst feed. The link brought me to to this etsy store where I could buy it for 20 dollars. Now if there’s anyone who appreciates handmade stuff, it’s me, but this looked so easy I wanted to try and make one, just by looking at it. magic loop, chain, single crochet, double crochet, single crochet in back loop, single crochet in front loop, fasten off. 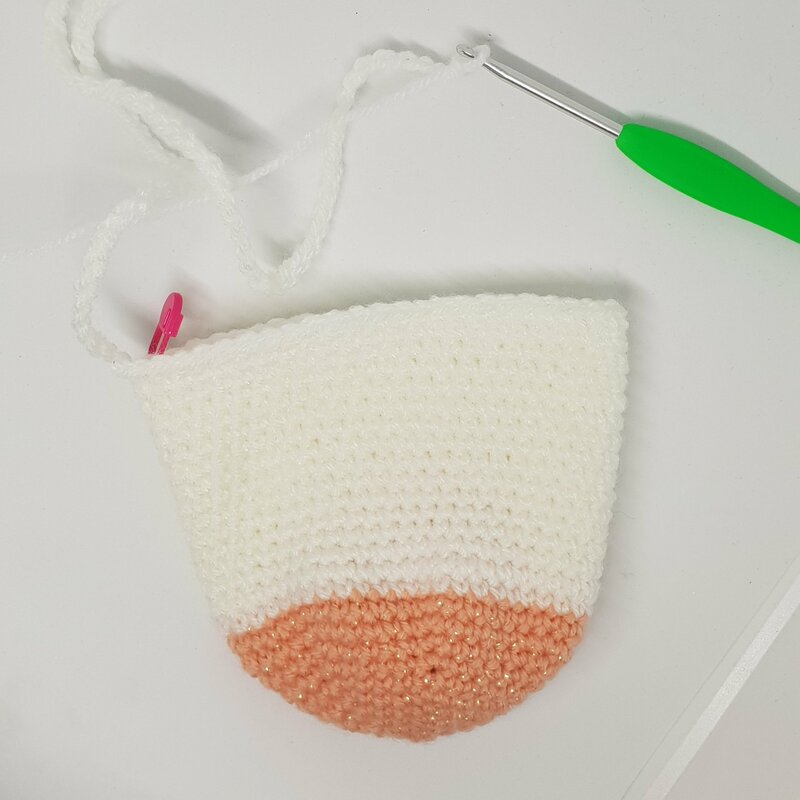 This bag is a short project and perfect for beginning crocheters. Start with magic loop in the color of the nose. R11 to 25 – 48 sc (48) – Do NOT fasten off! sc in sc where the chain started – fasten off. Count 24 stitches to the right and put a stitch marker in that one. Sew the shouder belt to the other side. Make sure it’s straight. Put the bag flat on the tabel and count three stitches to the the left of the shoulder belt and put a stitch marker in those stiches. Attach white yarn in the marked stitch and crochet 5 sc in the back loops. Put the back flat on the table again. Count 8 stitches from the shoulder belt to the right. Attach white yarn and crochet 5 sc in the backloops. Attach the pink yarn in the front loop (in front of the white ear you just made). Make sure you start one stitch further than where the white triangle started. Crochet 3 sc in the front loops. Repeat from “Attach the pink yarn in the front loop) on the other side. Sew the pink part onto the white part of the ear. Make sure you don’t see this at the back of your white ear. Sew the horn onto the front, in the middle of the two ears. Attach yarn in a color you want and ch 20. Crochet 2 sc in every ch. The curls come on their own that way. Crochet a slip stitch in the sc your starte and fasten off. Repeat as many times as you want. I chose to attach 3 colors. The bag is ready to magically put some smiles on some kids faces! 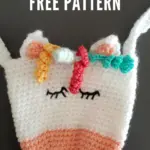 The pattern can be used, but please link back to this post and give credit. Let me know if you finished it, I’m so curious! 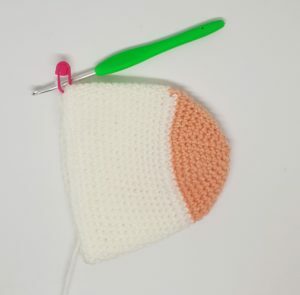 Maybe you would like to crochet te troll head too? Check out the pattern here. I used a 4mm. Hook.